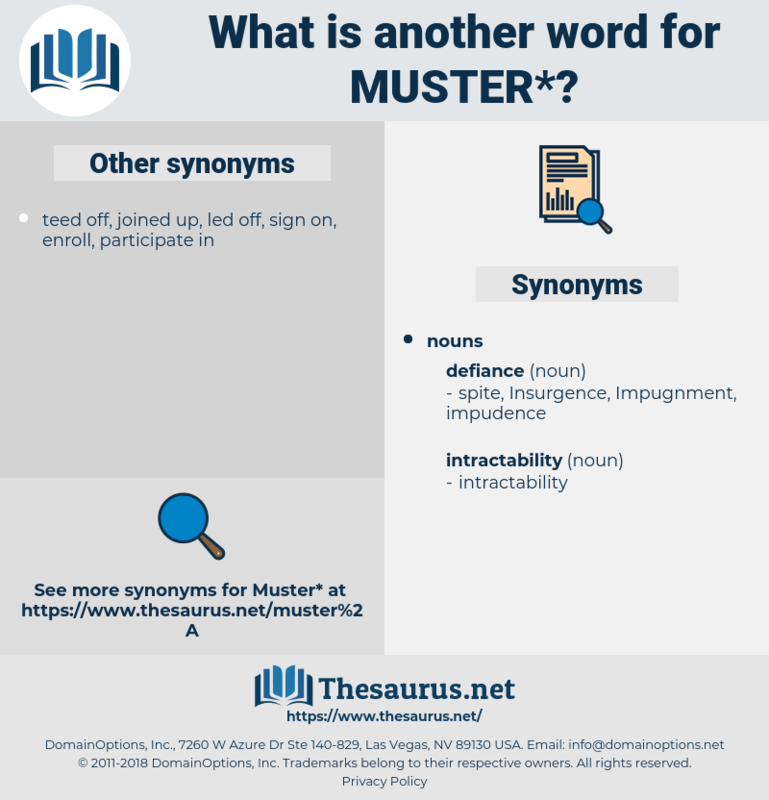 What is another word for muster? To assemble, especially troops; to collect and show; as, to muster one's courage. summon, collect, assemble, mobilize, compile, mobilise, demonstrate, garner, collate, convene, enlist, amass, accumulate, generate, Generating, reunite, unite, marshal, obtain, reassemble, raise, concentrate, find, found, galvanize, consolidate, rally, elicit, acquire. dissolve, discharge, adjourn, single, entity, disband, unit, item, prorogue. disorganize, cancel, dismiss, stop, divide, ignore, disperse, dodge, remove, destroy, separate, throw away, neglect, avoid, scatter. But I say, wouldn't it be better for us to go together to the horses, and hide by them or under them till the Boers muster? I saw him first at a muster. 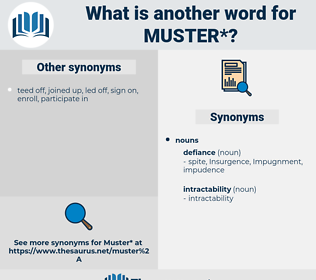 moisture, manchester, mixture, mango tree, megathere, maestro, muenster, Masseter, master, monstera, musketry, messidor, mastery, make water, mystery, musk deer, Mens Store, mouse deer, monster, musketeer, mass hysteria, myocastor, monastery, ministry, minster, Ming Tree, mycteria, mister, minister. garner, pull together, collect, gather.